Eight years ago today, I took the opportunity of 'Leap Day' to propose to my husband. As much as I may whine about him, he took the proposal in good humour and didn't immediately reach for his laptop (they didn't have iPads and iPhones back in the dark days) and book himself a one way ticket to Dar es Salaam. I asked him this morning if, after nine years together, eight years since we got engaged, seven years of marriage, six pets, five cars, four foreign holidays (mini breaks don't count), three different residences, two lost loved ones (my grandma, his mum) and the birth of one child if he would still marry me if I was to propose today. "That would be bigamy" he said. I'm sure there's a joke in there, somewhere, but humour isn't me strong point. Apparently people laugh at me, not with me. Which is the kind of thing a husband can say to his wife after so long together, without fear of divorce. Or at least in this house, he manages to get away with that. He gets away with quite a bit. Like the way he very rarely makes me a cuppa. He drinks about twenty cups of coffee a day, but if I want one, I have to ask (sometimes via text!). I don't get offered. Or his little habit of how he points out something needs doing so I'll feel guilted into doing it to prove a point, rather than me telling him to just do it himself. I do, however, draw the line at certain things (re-tiling the roof, laying a patio, cleaning the dogs' bottom glands) and pay people to do things. If he could find a way to get me to pay him for making me a cuppa, trust me he would. But tonight, in the spirit of recognising the eight-year anniversary (or is it two because of that whole leap year thing?? ), he kindly offered me a share of his gravy from his customary chicken-and-Uncle-Bens-Express-Tomato-Rice to go with my dinner. Then he looked a bit closer. "That's prawns, right? You don't really have gravy with prawns, do you?" At last. He's learning! There's hope for his culinary journey yet. The recipe is from Good Food (again). 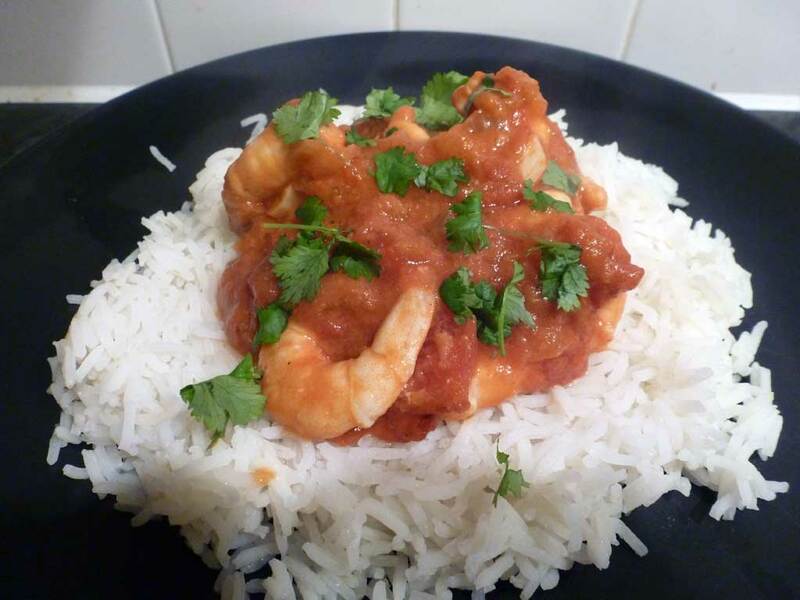 Quick, easy and tasty Wednesday night fodder. I've never had a Thai red curry before so I'm unable to comment on its authenticity. However, I will say that I found the tomatoes to be overpowering in their acidity and ended up adding a pinch of sugar and a teaspoon of fish sauce to the recipe to try to balance that out. It was still lacking even after this so I gave it a good squish of lime juice too and, whilst it was tasty, who knows if it was really meant to taste like that? I suppose to really understand the subtle flavourings, I would need to try it in a proper Thai restaurant. Pre-baby, we used to frequent a little restaurant called The Thai Barn in Bradford-upon-Avon which does the most amazing Thai food. Even the husband likes it. I'm hoping that one day the 'rents might get round to coming down for the weekend and babysitting so the husband and I can finally get a night out together. In fact, Thai food was another one of the inspirations for this challenge and I'm ashamed that it's taken me this long to try even the simplest of recipes. One of the things that planted the seed of the idea was watching a challenge on Masterchef where the contestents were asked to make some dish or another with a sweet chilli dipping sauce. I suddenly realised that whilst I could make a good stab at the main dish, I wouldn't have a clue how to make the sauce - instead relying all the time on Blue Dragon's Sweet Chilli Sauce with Kaffir Lime (I could bathe in that stuff). So I'll be updating the list of recipes I want to try with a few Thai-inspired ideas and pondering how I'm going to learn what an authentic red curry tastes like in the meantime. Watch this space. If you want to try today's recipe, you can find it here. Do read the comments below the recipe though, I think they really make the difference to the dish.